"I have had blood on me before. I have even had yours on me at one time." Much to the chagrin of nearly everyone around me, Jackie Chan films just don't do it for me. Sure it is exciting to see Jackie bouncing off walls and doing amazingly creative things with random objects, but there has always been something lacking in his films. I would suppose the same could be said about most martial arts films, in that a thin story line and poor acting often hampers the overall success of the film, although there are notable exceptions (Crouching Tiger...). The evil Killer Bee gang is about to attack, so Cao Le (Chan) chases away Chin Chien, his pregnant girlfriend, and one of palace maidens, saving them from certain death. The gang is lead by Chin Chang Yin, who is seeking revenge on Le after his father scarred her face for life. Le sets out on a difficult journey to find his girlfriend, with Yin following his every every move. Soon though her need for revenge is hampered by the fact that she is falling for him. 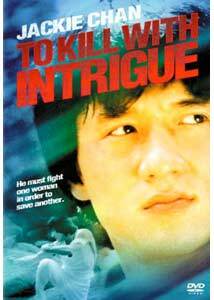 To be honest this isn't exactly Shakespeare, but the plot of To Kill With Intrigue does show more originality and heart than numerous other martial arts films. Although with the good you must take the bad, as the plot is often overloaded with unnecessary complications that make it difficult to understand what is occurring onscreen. With a more straightforward dramatic plot line than has become commonplace with his later films this early work shows a broader range of Chan's acting abilities. As his character moves through his journey he is given a chance to grow and develop into a three-dimensional character. Complete with the trademark sounds of fists flying and swords clanging (yes, the infamous whoosh, whoop sounds are in abundant supply here), there is little enjoyment to be gained from the fight scenes in To Kill With Intrigue. Often the sequences are cut so quickly and choreographed so poorly that one can't tell who is fighting. Chan's fight with a trio of torch wielding villains is perhaps the lone bright spot in this film. Chan does a fine job here in an early performance (he is actually credited as Jacky Chan in the main title sequence) and his work here is sure to shock those who know him only from his current American projects. From slapping his girlfriend around to being beaten in nearly every fight this is not the Jackie Chan you are used to. Displaying long hair (the cover art photo isn't even from this film) Chan is almost unrecognizable in this film, which was apparently made under contract by the film's director Wei Lo. Image Transfer Review: Presented in 2.35:1 anamorphic widescreen, To Kill With Intrigue looks better than I expected, though there are still flaws in this transfer. Colors are often muted while black levels look fine with little grain and good shadow detail. Edge enhancement is at times a problem while print flaws are understandably present given the age of the film. While this may sound as though I found too many problems with the transfer to give it a passing grade, when taking into consideration the age and likely original condition of the print I find the flaws acceptable. Audio Transfer Review: A mono 1.0 track in both English and Cantonese is as one would expect of lesser quality, with dialogue sounding empty any tinny from time to time. Aside from the action from the center channel there is little else going on with this sound mix. Extras Review: Trailers for Crouching Tiger, Hidden Dragon, The One, and Gen X Cops are each presented in anamorphic widescreen. Static film themed menu pages and 28 chapter stops make up the remaining extra features. For those hoping to compile the quintessential Jackie Chan collection a purchase of To Kill With Intrigue would be justifiable. But for those looking for a good kung fu film look elsewhere. Of the two times I viewed this film before reviewing it I had a better time with friends laughing at the sets and acting rather than appreciating the film.